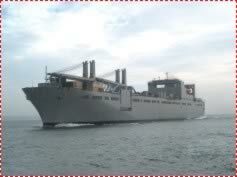 The US Navy Ship Pililaau (AKR304) arrived in Durban harbour on Monday, 20 January 2003 to load bunkers at Island View 9. The ship is presumed to be on her way to the Gulf and was noted carrying deck cargo which included military trucks painted in desert colours. The highly impressive-looking ship measures 298.5m long and is over port limitations, therefore requiring a daylight entry that was accomplished shortly after 06.00 with the usual efficiency expected of both the Durban port and a US Navy ship. USNS Pililaau is one of seven ships of the Bob Hope class of pre-positioning vessels, designed to provide the US military with fast and reliable transport - a lesson learned well during the Gulf War. Designated as a Large, Medium-Speed, Roll-on/Roll-Off ship (LMSR), Pililaau is one of the more recent additions to the Military Sealift Command. The ship is capable of transporting a US Army task force of up to 300 troops in addition to a vast mount of stores and vehicles consisting of 58 tanks, 48 other track vehicles and more than 900 trucks and other wheeled motor vehicles. The ship is equipped with a slewing stern ramp and a removable ramp and two 110-tonne cranes. In addition to combat missions she is designed to carry vehicles and equipment to render humanitarian assistance and has inside storage space the equivalent of almost 8 rugby fields. The ship is powered by four diesel engines that produces 65,160 bhp and drives two shafts giving Pililaau a speed of 24.9 knots, slightly more than the gas-turbine engines of the similar Watson class. USNS Pililaau was built at the Avondale Shipyards in New Orleans and was delivered to the Military Sealift Command on 24 July 2001. Most of the LMSR ships are named after recipients of the US Medal of Honour - in this case the honour was for Pvt First Class Herbert K Pililaau who distinguished himself in Korea in September 1951.